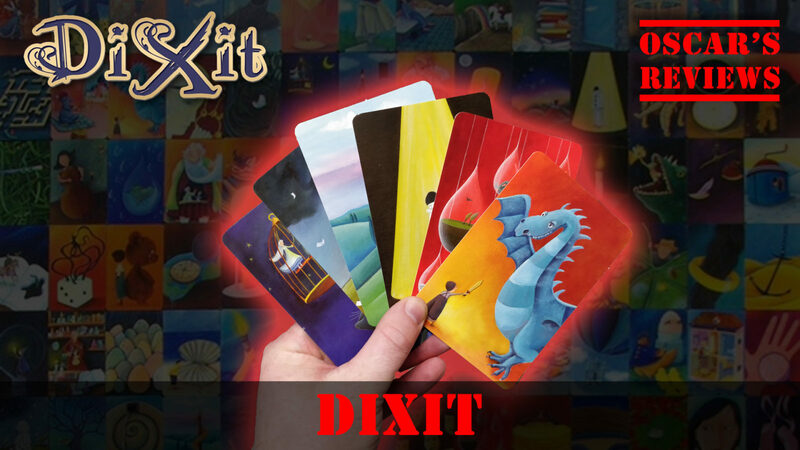 “Dixit” is a story-telling game where a picture is worth a thousand words. 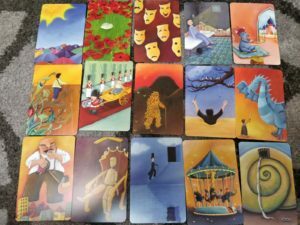 The aim of the game is to describe the illustrated cards using a word, a poem or a story and for the other players to guess. The artwork is captivating and upon opening the box you are met with even more beautiful artwork and an integrated board. We liked how the board was built into the box with an area in the middle for storing the 84 cards, 6 wooden rabbits and 36 voting tokens. 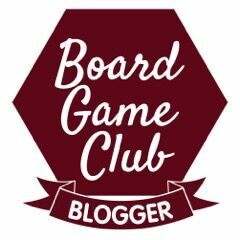 So, how do you actually play the game? Well, each player chooses a rabbit and takes 6 voting tokens (numbered 1-6) that match their rabbit’s colour. Everyone is also dealt 6 of the illustrated cards face down. The instructions give slightly different set up instructions depending on the number of players – 4, 5 or 6 players. This is where we hit our first little snag – the box clearly says it is for 3-6 players yet the set-up instructions are only for 4 or more players. 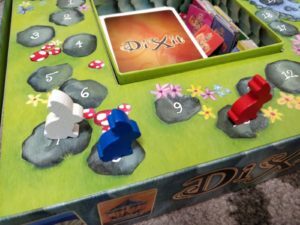 It is only when you look at the back of the instructions after the examples and tips that you see that the 3 player game is classed as a variant. It wouldn’t be too difficult to add a note saying “see overleaf for 3-player variant” in the set-up part of the instructions. 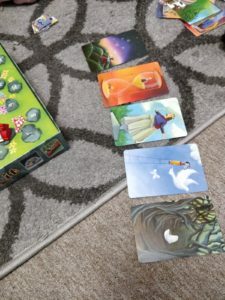 The first player becomes the storyteller and chooses one of their cards and describes it in “a sentence” – the instructions state that this sentence can be a single word, a few words, a whole sentence, a poem, a sound, a movie title, a line from a song, an extract from a book…. It’s very vague and completely up to the storyteller how they describe it. Once they have said their sentence out loud the other players pick one of their cards that is as close to the description as possible (in the 3 player variant the other players pick 2 cards). These cards are all shuffled together and laid out, in a line, face up. 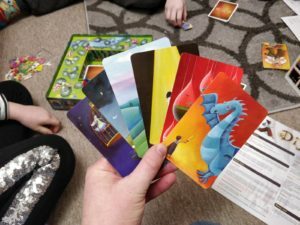 The next step is for the players, except the storyteller, to guess which card was the storyteller’s based on their description. To do this they use a voting token to match the card they think is the storytellers and place this face down. For example, if you think the 4th card from the left is the storyteller’s then you place your number 4 voting card. Once each player has voted, the votes are turned over and we see who guessed correctly. If everybody guesses correctly then they move forward 2 points on the board and the storyteller scores nothing. If some, but not all, guess correctly then the storyteller moves forward 3 points (players whose picture was guessed incorrectly also get a bonus point). If no one guesses correctly then the storyteller gets nothing and the other players move forward 2 points. We found the scoring system to be a little strange – the storyteller is penalised for a good description (everyone guesses correctly) and for a bad description (no one guesses correctly). We can’t think of any other game where you are rewarded for being average. After scoring, the used cards are discarded and players make sure they have a full hand of cards again. The next player then becomes the storyteller. The game ends once all the cards have been played – the box says this should be around 30 minutes but our game took nearly an hour. 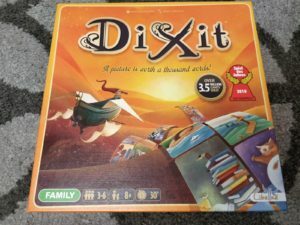 Overall, we weren’t very keen on “Dixit” mainly because there were no real rules with regards to describing the images. With two autistic children that struggle when things aren’t “black & white” and that can’t always grasp “theory of mind” (the idea that other people will be thinking in different ways to them) it just made it too difficult. 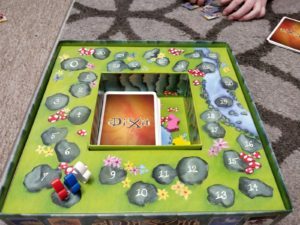 I could see “Dixit” working well in a family that frequently told stories together or even in an educational environment, but it just didn’t work for us. In terms of “imagination-based games” we found Rory’s Story Cubes to be a much better fit to the way the kids’ minds work.